Tel Aviv Rabbinical Court rules woman who filed false complaint against husband should lose alimony. The rabbinical courts and family courts constantly hear cases in which false complaints are submitted to the police causing restraining orders to be issued wrongly in attempts to gain an advantage in marital and family disputes. 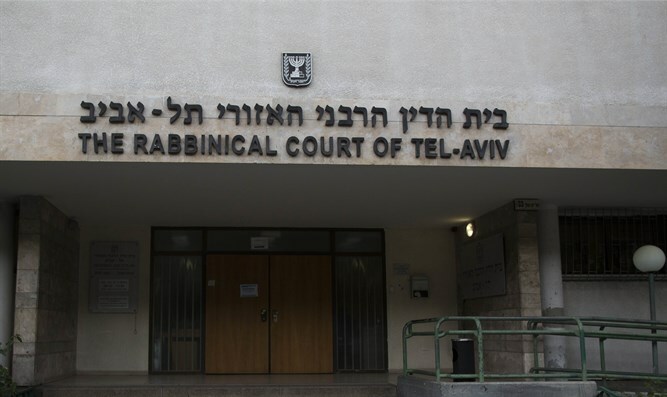 The Tel Aviv Rabbinical Court published a ruling critical of a woman who submitted a false complaint against her husband. The court had ruled on a dispute between a Tel Aviv real estate agent and his wife, a veterinarian. The couple have two children, ages four and two. At one point the wife filed a complaint with the police, causing the the husband to be distanced from his home for five days. She then turned to the family court, which ordered that the husband be removed from the home for 90 days. The police and the State Prosecutor's Office investigated the complaint and found that the wife had threatened to file false complaints against her husband. The file was closed due to lack of evidence. The wife, who had previously sought a divorce, then filed a reconciliation request to freeze the divorce proceedings for tactical reasons in order to receive greater economic benefits as per Israeli law. In the groundbreaking ruling, the judges wrote that: "When an unjustified complaint is filed, the consequences for the husband are unbearable. The police by default issue a restraining order, and there is long-term harm. The procedures for issuing protection rely on evidence lighter than a feather-weight. The courts err on the side on safety out of fear of violence, and so, even if the accused is found innocent at the end of the procedure, the humiliation involved tarnishes his good name and in many instances harms his employment. Removing a person from his home on the basis of a false complaint constitutes physical violence...On the other hand, the complainant achieves tactical gains in custody proceedings, legal fees, etc. and there is also a direct connection [with these false complaints] and the amount of alimony. In the end the man finds himself in a Kafkaesque situation." The judges ruled that "the woman must divorce and lose her alimony, as well as the court fees for filing the [false] complaint with the police." The Haifa Rabbinical Court ruled last week that "the party which filed the false complaints has lost [the case] and has caused great harm."